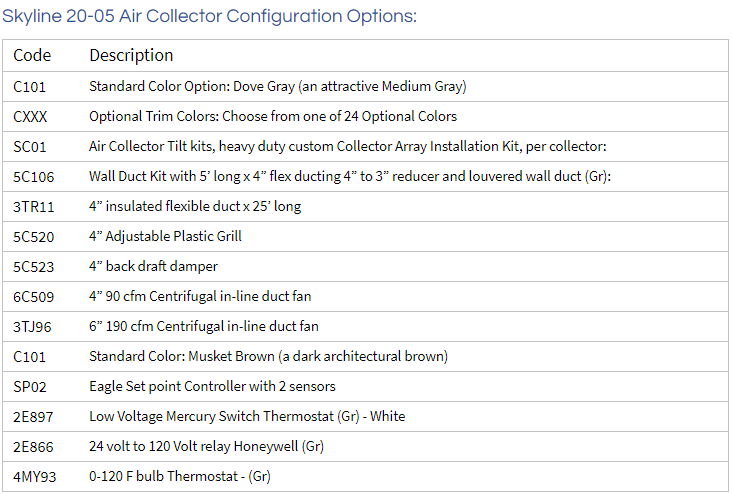 SolarRoofs.com Exclusive Air Collectors are very lightweight and comparatively easy to install. System components such as fans, ducts, etc. will need to be purchased separately. The video below shows some details. SolarRoofs.com’s low cost Skyline 10-05 (10 s/f, 20″ x 6′) and 20-05 (20 s/f, 20″ x 12′) Air Collectors are a new generation of lightweight, easy to install air collectors that are very effective and delivering Btu’s directly into the home, office or warehouse. Systems should be sized to have a minimum of 1 sq /ft. of collector area per 10 sq/ft of floor area, it can be less in warmer areas, more in very cold climates. These collectors can be custom configured with holes cut or seals and racks supplied to fit your specific needs. 4″, 5″, or 6″ holes can be made at the center of either end and 1″ by 6″ air slots can be made at each corner to facilitate series air flow through multiple stacked collectors. Always ensure that the fan pulls air through the collector, never push air through the collector(s). Other color options are available at an extra cost. See other sections for tilt kits. These high-performance air collectors can be custom configured with 1” x 6” air holes in any of the 4 corners or 6” round holes in the bottom end(s) of the collector.